Also known as Chief Bowl, Colonel Bowles, Bold Hunter, and the Bowl, he was known to the Cherokee tribe as Diwal’li. Bowl was born in North Carolina around 1756. He was the son of a Scottish father and a Cherokee mother. In 1791 he signed the Treaty of Holston, and in 1805 he signed an unauthorized cession treaty, a move that proved unpopular with the majority of Cherokee. In 1810, his band moved to better hunting grounds near New Madrid, Missouri and then two years later to northwestern Arkansas. In 1819, they relocated to what they hoped would be their permanent home near Nacogdoches in northeastern Texas. There, he became the “peace chief” of a council that united several Cherokee villages. The Cherokee were welcomed by the Mexican government, who saw them as a barrier to white settlement and Bowl began to negotiate with them to obtain permanent title to the land, but they were never finalized. After the Texas Revolution, Bowl once again began to negotiate with Sam Houston for possession of the lands. 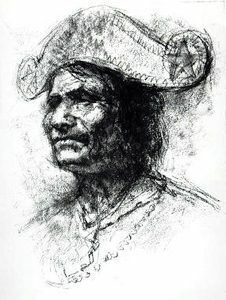 On February 23, 1836, in a treaty made by Houston, Bowl signed a treaty that, though substantially reducing the Cherokee landholdings, would give them permanent title. Unfortunately for the Cherokee, the Texas Senate would not ratify it. Houston’s successor, Mirabeau B. Lamar, opposed all Indians in the new republic and ordered Bowl and his people to leave Texas. This led to what is known as the Cherokee War. On July 14, Lamar sent troops out to enforce his orders and the Indians fled northward into present-day Van Zandt County. They halted on July 15 and prepared defenses at the confluence of Warrior Creek and Kickapoo Creek on the Neches River. On the morning of July 16, 1839, Chief Bowl and his warriors were severely outnumbered but Bowl made every effort to win, driving his warriors to fight bravely. In the end, the Cherokee were outnumbered and depleted of ammunition, Bowl ordered them to retreat. However, Chief Bowl remained. Sitting on his horse, wearing a military hat and sword given to him by Sam Houston, he faced the advancing Texans. He was soon shot in the thigh and the back. On the ground, unable to walk, he raised himself to a sitting position and began to sing a war song when Captain Robert W. Smith shot him in the head. As a further insult, Smith then took the sword from Chief Bowl’s body and took swaths of his skin from his arm as a souvenir. The Battle of the Neches was the last engagement between the Cherokee and whites settlers in Texas. The battle site is represented by a marker at a roadside park on Highway 20, five miles east of Colfax, Texas. ©Kathy Weiser/Legends of America, June 2018.